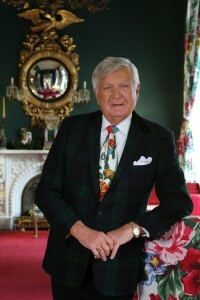 Carleton Varney is one of America’s best-known interior designers and president/owner of Dorothy Draper & Co. Inc., one of the oldest continually operating interior design firms in the United States. Named after the founder of the company- Dorothy Draper, who was the doyenne of interior design from the 1920’s to the 1960’s. The company’s design philosophy stresses the use of bright colors and the rejection of all that is impractical, uncomfortable and drab. In embracing this practice Carleton Varney continues the tradition of Dorothy Draper by being associated with the adventurous use of vibrant colors, floral patterns, and bold contrasts. Mr. Varney’s impressive roster of clients includes superstars from the worlds of entertainment, fashion, and business. He is associated with the restoration and decoration of countless hotels and resorts in Europe, Asia, the Caribbean, and the United States. Among them: Dromoland and Ashford Castles and Adare Manor (Ireland), The Westbury Hotel (London and Brussels), The Colony Hotel, The Breakers, and The Brazilian Court (Palm Beach, Florida), The Waldorf Towers (New York City), The Copley Plaza (Boston, Massachusetts), The Grand Hotel (Mackinac Island, Michigan), The Greenbrier Hotel & Casino (White Sulphur Springs, West Virginia) and the Greenbrier West Village Resort (Japan). The Mount Washington Hotel (New Hampshire), The Stoneleigh Hotel (Dallas, Texas), Peter Island Resort Hotel (British Virgin Islands), Villa Madeleine (St. Croix, U.S. Virgin Islands), and for the Rock Resort Collection of Hotels including St. John’s Island (Virgin Gorda), Jackson Hole (Wyoming), and on Maui (Hawaii). He decorated the Governor’s Mansions in West Virginia and Heartford, Connecticut, and was involved in the decoration of the U.S Ambassador’s Residence in Tokyo, Japan and in Dublin, Ireland. He restored and redecorated the Official Vice President’s Residence in Washington D.C. during the George H.W. Bush administration, and was the color consultant for the Carter Presidential Library and the consultant for several functions, parties, and State Dinners for visiting dignitaries at the White House during the Carter administration. He also redesigned and decorated the Carter residences in Plains and Ellijay, Georgia. In addition to the decoration of numerous national and international private residences, the company has also decorated cruise ships and private plane interiors. Carleton Varney was the curator of the former presidential yacht, the USS Sequoia. In 2008 he also designed the Architectural Digest Green Room for the Academy Awards celebration at the Kodak Theatre in Los Angeles. Mr. Varney’s versatility in design can be seen in the wide range of products that bear his mark, ranging from dinnerware, crystal, eye wear, home accessories, to scarves, including the 2017 Newbridge Silverware of Ireland home collection that bears his name. He has designed furniture collections for the Romweber and Kindel Furniture companies as well as for Ficks Reed. Since 1962, he has been creating designs for Dorothy Draper Fabric & Wallcoverings, which grace the rooms of some of America’s and the world’s most beautiful resorts and residences. Mr. Varney also writes a weekly decorating column, “Your Family Decorator,” in the Palm Beach Daily News, also known as ‘The Shiny Sheet’. Please visit Carleton’s website at www.carletonvarney.com to shop for exclusive designs from the Carleton Varney and Dorothy Draper collection, as well as read his not-to-be-missed weekly decorating blog.